No but seriously who's Corrin? 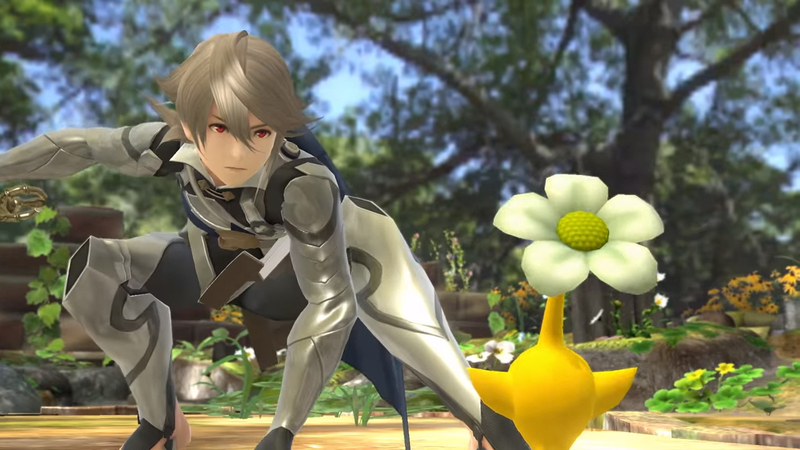 I'm sure many of you shared my reaction to the initial announcement that Corrin, the upcoming player-character from Fire Emblem Fates, was going to be in Super Smash Bros. But, as soon as some of the moveset was actually shown, it was clear that this wasn't "just another anime swordsman" addition to the roster. 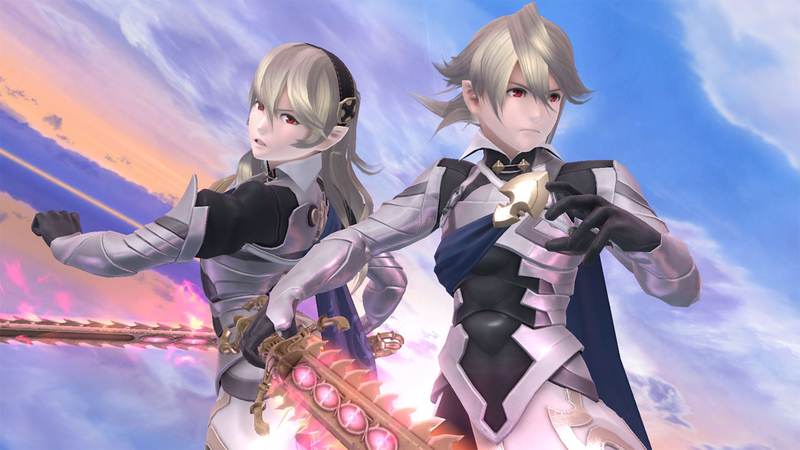 All things considered, Corrin is easily my favorite Fire Emblem character to play as. 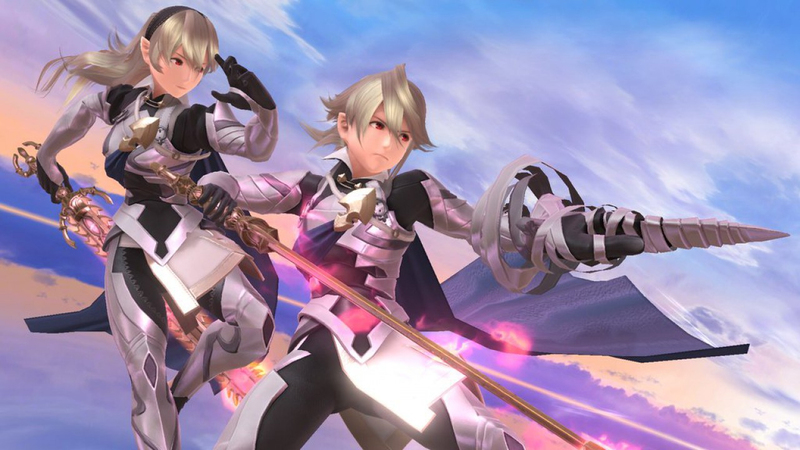 What separates Corrin from the rest of the sword-fighters is his ability to morph his body into a dragon. Some moves, like his tilts, do utilize his sword (which is part chainsaw, by the way), but most of his attacks have him transforming some part of his body into a gigantic dragon-spike. The result is that surprisingly few of his moves actually use his sword. That being said, spacing (keeping a perfect amount of space between you and your opponent) is just as important while playing Corrin. His arm can turn into a giant spike, and hitting with the tip does the most damage, similar to Marth. Both his forward smash and his side special utilize the spikey arm, so it's always important to visualize where it will reach in order to capitalize on damage output. Corrin's side special seems to be getting the most use and attention. When used from the ground, he performs a little hop. When the player presses B again, the spikey arm comes out and will attach Corrin to a stationary position if it hits the ground. From this stationary position, pressing the button again will launch Corrin forwards with a kick, which has good damage and knockback. If used in the air, there's no hop, but everything else works the same. This move is super interesting. Stabbing an opponent and latching to the ground guarantees the kick to connect, since it freezes the enemy in place. Sticking to the ground is unexpectedly useful and gives Corrin a few options. Doing nothing will drop Corrin back to the ground after about three seconds. Pressing left or right will perform the kick in that direction. This can be used as an approach or an escape, and can catch someone off guard if they aren't being careful. Speaking of catching people off guard, Corrin's neutral B gets me every single goddamn time. It's a two-part move: a projectile and a melee chomp, both of which can be charged. The thing is, you can charge one and not the other! Holding down B will launch a big projectile that stuns after about two seconds. 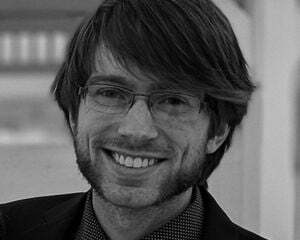 Continuing to hold B will release a big melee-ranged chomp after another two. However, tapping B and then holding it immediately afterwards will release a tiny projectile immediately, followed by a charged chomp. Or you can start by holding B and immediately release it for a big projectile and tiny chomp! This move has way more depth than I originally noticed, and it has a ton of applications. In melee range, an uncharged projectile will stun an opponent long enough for the fully charged chomp to connect, resulting in a whopping 24% damage! Having both fully charged results in 33%, so there's really not too big of a tradeoff, considering the difference in practicality. What I always seem to forget about is the chomp. I'll evade the projectile thinking "Ha! A chance to punish!" and then promptly get destroyed by a fully charged chomp. Corrin's down special is a counter that hits on both sides, but nothing else is noteworthy about it. His up special spreads wings and flies up at an angle, but the angle can be adjusted. Just tapping the button sends him at about a 70-degree angle upwards. However, holding a direction will influence it. Holding forward gives him more verticality, while holding up does the opposite. Just something to keep in mind while recovering. In terms of normals, his forward smash is easily the most interesting. As mentioned before, it has a tipper, but it also has one more unique property. While charging the smash, Corrin holds out his chainsaw sword, which will damage anyone who touches it. This keeps them in place, allowing Corrin to send his spikey arm out for a guaranteed hit. Granted, this does less damage than a fully charged tipper hit, but it's still worth noting. Really, Corrin seems to have it all. If Marth didn't just receive buffs in the latest patch, I think all Marth players would move to Corrin in a heartbeat. His forward air is great, he can keep people away and attack at range (with a tipper), he has a very solid projectile, and his average recovery isn't easy to gimp. Corrin is a well-rounded character that will likely see a lot of competitive play in the years to come.